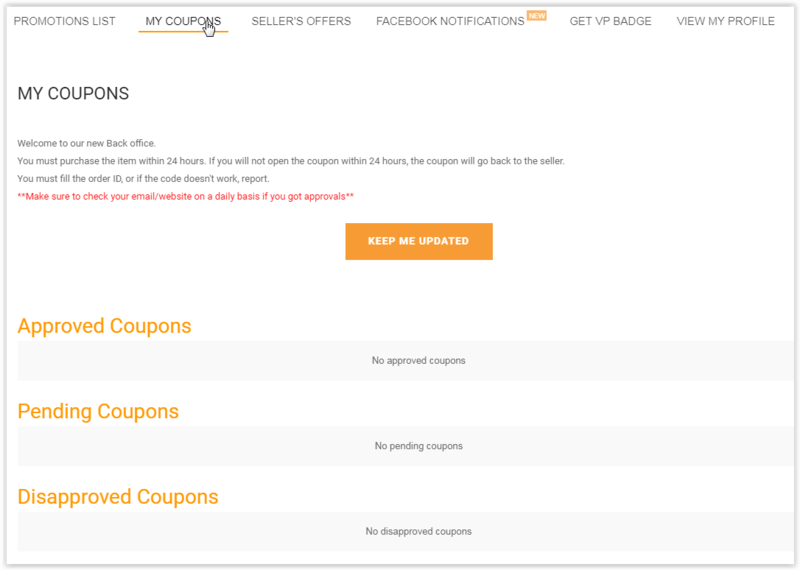 Hi, when you ask for a coupon, your request will appear under “My Coupons” tab. There are 3 different sections: Approved coupons, pending requests, and disapproved coupons. There are 24-48 hours to until the approval expired. In case you are not interested in the coupon after your approval, you can return the code to the seller. * Expired coupons will hurt your Rank Booster Ranking. *Returning the coupon before you clicked on “Show Coupons” will not hurt your ranking. Sometimes you have to scroll down the page to get a text box. If coupon says $1.00 should it be $1.00 with shipping or without? I’m finding that some of these have shipping. So I have been marking wrong price is this correct? The coupon code was *Expired*… I placed a report. and it IS EXPIRED too! – – – Both codes were used Before 24 hours of issue. I had 2 coupons that would not work, I reported them, the seller submitted 2 new coupons and they still do not work. Can you help me with this? I ordered two watches (one black, one white, but other than that, the same), and Amazon put them on the same order number, but now I can’t clear the “action required” (says I have the wrong order number). I tried refreshing, and a different browser (the first cleared fine, so I am guessing the system thinks the “Order Number” was already used). What causes a request to be Disapproved? Each seller has a different reason for declining requests. It might be because of insufficient followers, no more coupons, request duplication.